Of all places I visited in Turkey, Diyarbakır felt entirely different. When I first visited Southeastern Anatolia two years ago, I didn‘t manage to visit Diyarbakır, but met some travellers on the Dolmuş who told me how they were robbed by street kids. But nonetheless, the city is always advertised as one of the places you should definitely see in Turkey. Most famously, the city walls surrounding the old town that are supposed to be the second largest wall in the world, after the Great Wall in China. Build of black basalt stones, it gives the city a sombre look. 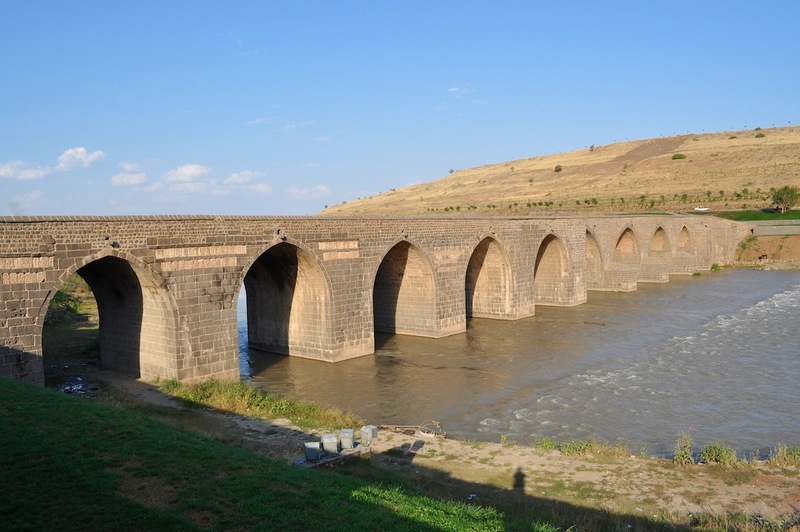 I also saw further pictures of buildings of basalt stone, often contrasted with white limestone, as well as the Dilce Bridge and the green landscape on banks of the river Tigris, so unlike the rocky and sandy scenery you normally find in South Eastern Turkey. 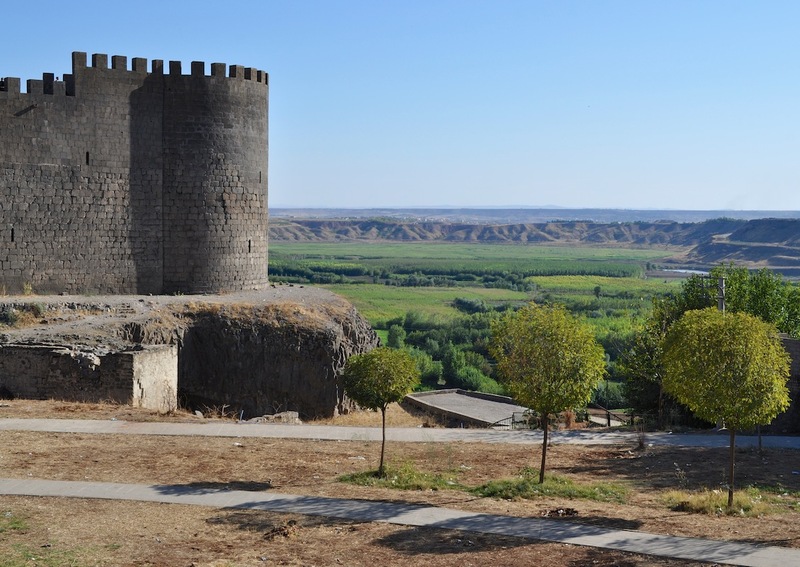 Amed – Diyarbakır‘s ancient name that is still used by some people – is also considered to be the Kurdish capital in Turkey. Therefore, the city is also known for its political and social tensions. Last October I finally managed to visit the city, and apart from taking in the sights, I also experienced the tensions. way. In a demanding tone he asked me what I was doing here. I explained that I was taking a walk. Nonetheless, he wanted to see my passport and after that searched my bag. When his search uncovered a list with Kurdish names he called some of his colleagues. I explained that I had visited a Kurdish café in Mardin the day before where I liked the music a lot and asked the waiter to write down the names of the artists. The tone of the officers got more urgent and I was questioned for 20 minutes about the list, my hotel, what I was doing in Turkey and Diyarbakır, etc. Then I was told to leave the area immediately. 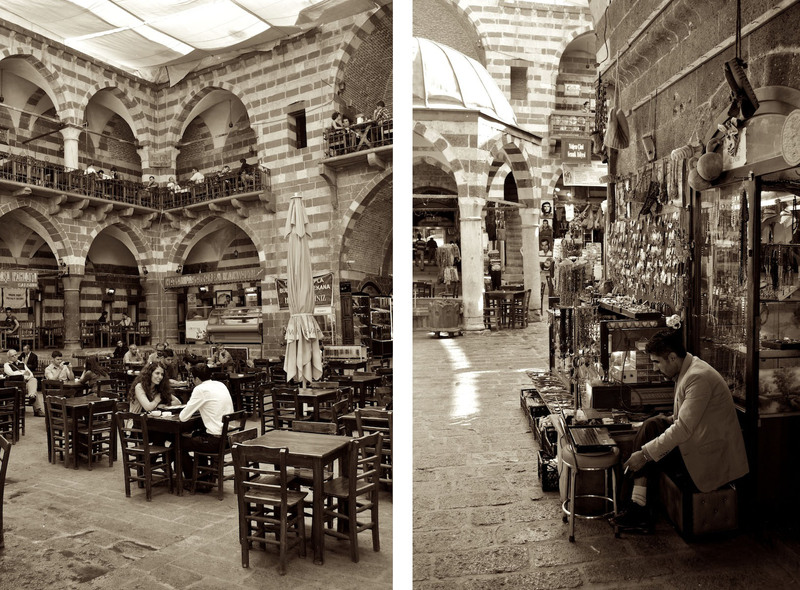 When I finally arrived in the city centre I went to Hasan Paşa Hanı to calm me down with a glass of tea. Later I became friends with some locals who showed me their city and introduced me to Diyarbakır cuisine and culture. But I coudn‘t shake the feeling of unease, especially walking around the old town – something I never experienced in Turkey before. I felt the tension the city suffered from. When I told people of my encounter with the police, they reacted like it was a normal thing. Living there, one had to arrange oneself with the tensions, I believe. Originally I expected having to deal with children that wanted to steal my things – but I didn‘t encounter any of them. Every child I saw on the street didn‘t show any interest in me. However, I noticed a lot of homeless people (that, apart from Istanbul, I never noticed in Turkey before) and can imagine that poverty is one of the major problems the city faces that also heats up the tension. 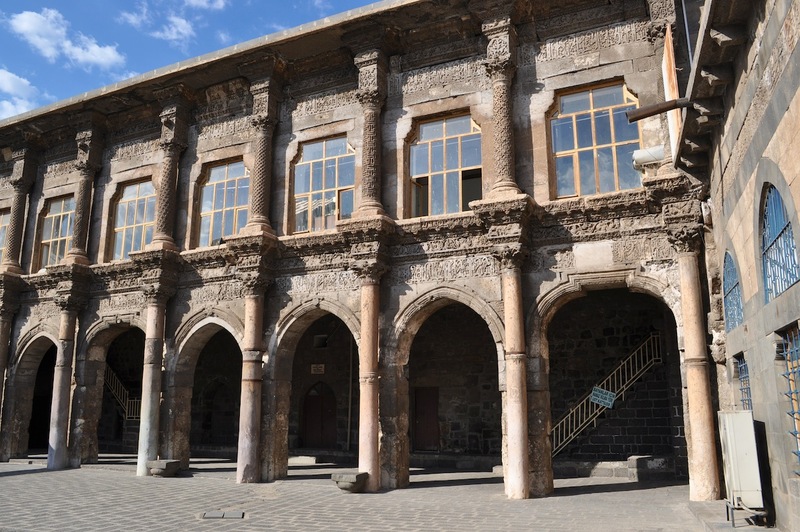 But still, Diyarbakır is a place worth visiting. The architecture of the old buildings is unique and Kurdish culture can be experienced from the singers at Dengbej Evi to modern urban life in Ofis. And before I forget: I wasn‘t able to get all the music from the list – but from what I found I can really recommend Ciwan Haco, Mohsen Namjoo and Mehmet Atlı. Oh nice I feel I can love that place already… I wish I would travel more… Great post and beautiful shots! Your recommendation of the music gave me a very nice experience with Mohsen Namjoo. Thank you for your comment, Hanna. …I’m glad you enjoy Mohsen Namjoo – it if one of my great discoveries of Kurdish music as well. Turkey is a beautiful country and a heaven for a photographer I can think. For me it is a country which gets my inspiration going. A rich culture, special attractive lines, figures, colours and light. Yes, I think it is very fascinating as well. It has so many different landscapes and cultures/cultural heritage – that is fascinating and can inspire you to do wonderful photographs, or whatever kind of work you like to do. And as I speak some Turkish I always get to know the most interesting people – especially when I travel through the Eastern parts. Thank you again, for reblogging one of my blog posts. Can you imagine now why so many Europeans do not like it that Turkey would become part of the European Union, where everybody should be free to walk wherever they want? I think that one of the main problems is that Turkey is a very big country and would instantly gain a lot of power – which especially Germany and France wouldn’t like. …I think most people in Europe wouldn’t even know what is going on in Turkey outside of the tourist areas. Being it so big that danger of demanding lots of power is a great danger. Lots of people are not aware of the torturing that goes on in that country and are mostly afraid of the Muslims, which have become more fanatic than in the 1970ies-1980ies when it was a very modern and open country. And yes many tourists only know their hotel swimming pool and very near environment of shops, but miss all the culture and beauty of the countryside. I have been to few places in Turkey, but never heard of this place. Interesting.